Andreas Fath, a world-record-holding endurance swimmer and professor of Medical and Life Sciences at Furtwangen University in Germany, swims alongside Juri Jander down the Tennessee River Friday, Aug. 4, 2017, in Chattanooga, Tenn. Jander is a student where Fath teaches who is doing his thesis on micro-plastics. The Tennessee River has an alarming amount of microplastics that could threaten the health of species in one of the world's most aquatically biodiverse freshwater ecosystems, scientists warn. 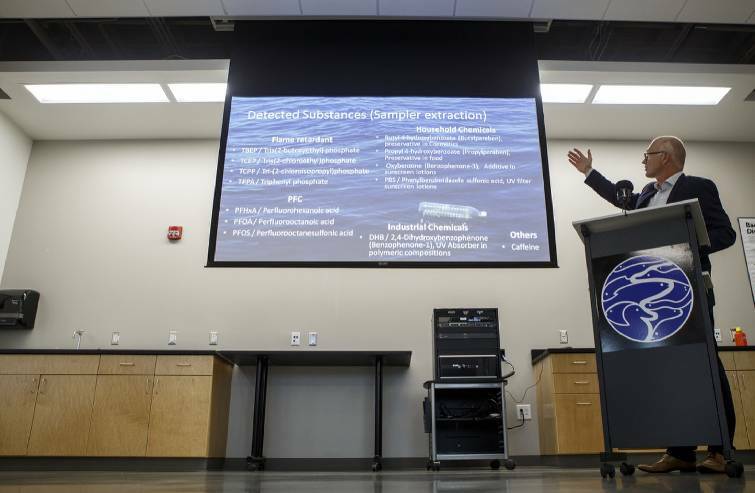 Results of the most comprehensive study on surface pollutants in the Tennessee River's history were unveiled Wednesday morning at the Tennessee Aquarium's Conservation Institute. The study found the river is mainly healthy with the exception of a shocking amount of microplastic — small pieces of plastic that pollution breaks into. The pollution was attributed to the region's culture of littering, citizens' lack of involvement in recycling, and the amount of plastic packaging in the U.S.
"I was shocked when I analyzed the microplastics," said German scientist Andreas Fath, who conducted the study. "We triple-checked the results because it was so much different." The Tennessee River has 80 percent more microplastic than China's Yangtze River — which a study found to be the source of 55 percent of all river-born plastic entering the ocean — and 8,000 percent higher than the much more heavily populated Rhine River in Europe. During the swim, Fath wore a specially made wetsuit that collected the samples. Fath and Martin Knoll, a professor of geology and hydrology at Sewanee: The University of the South, spent a year analyzing that data and conducting research. Andreas Fath presents his findings from swimming the length of the Tennessee River during a presentation at the Tennessee Aquarium Conservation Institute on Wednesday, Oct. 10, 2018, in Chattanooga, Tenn.
Fath conducted a similar experiment on the Rhine River and has sampled rivers around the world. The Tennessee River is relatively healthy compared to other rivers, he found. There are low amounts of chemical pollutants, such as pharmaceuticals. "But the big thing is the microplastics," Knoll said. "The microplastics, I'd say, is really disturbing. The Rhine should have more [compared to the Tennessee]. You have 50 million people living along the water, compared to 5 million here. You start to look for reasons. I think it's the lack of recycling here and the littering culture." The findings are like the tip of a large iceberg, Fath said. The research took more than a year and only sampled the river's surface. A full study would take more funding and more time, he said. There has never been a comprehensive study of pollution below the river's surface, meaning the majority of the problem is not fully known. Scientists fear it is much worse below the surface. The research found most of the microplastic pollution was from polyethylene, which is used to create packaging. That plastic is heavy and often sinks below the surface. The impact of the pollution isn't fully known, either. There is evidence that microplastics hurt aquatic invertebrates, such as mussels, Fath said, which is especially alarming for the Tennessee River watershed. The river and its tributaries are home to more than 300 species of fish and 125 species of freshwater mussels, making it the most biodiverse freshwater ecosystem in the world. "It's the first time we've had a really comprehensive look at the health of the Tennessee River for the water quality," Tennessee Aquarium Vice President of Education and Conservation Anna George said. "There's some very good news in there but a huge concern for all of us is the high level of microplastics. We don't know the impact of all of these microplastics on our animals, but it certainly means we need to start studying that immediately." That's where George sees the aquarium coming in to help. The aquarium's goal is to be part of a research effort, she said, which could determine the scope of the problem and its impact. Fath recommended steps that could help in the meantime: a reduction of single-use plastics, support for the implementation of a bottle bill, reduction or substitution of plastic packaging, and the use of reusable plastic, among others.